Date Night celebrates its 10,000th reader! We don’t know who you are, but thanks for reading the blog! We are also celebrating the longest day of the year. We first started doing something special for the summer solstice after we toasted it with champagne in France at the base of Mt. Ventoux on June 21, 2007. Tonight’s date is not as elaborate, but it’s still great fun. Read on for a Date Night to-go, because we are always on the go. Heirloom Market looks like a convenience store because it’s attached to a convenience store. 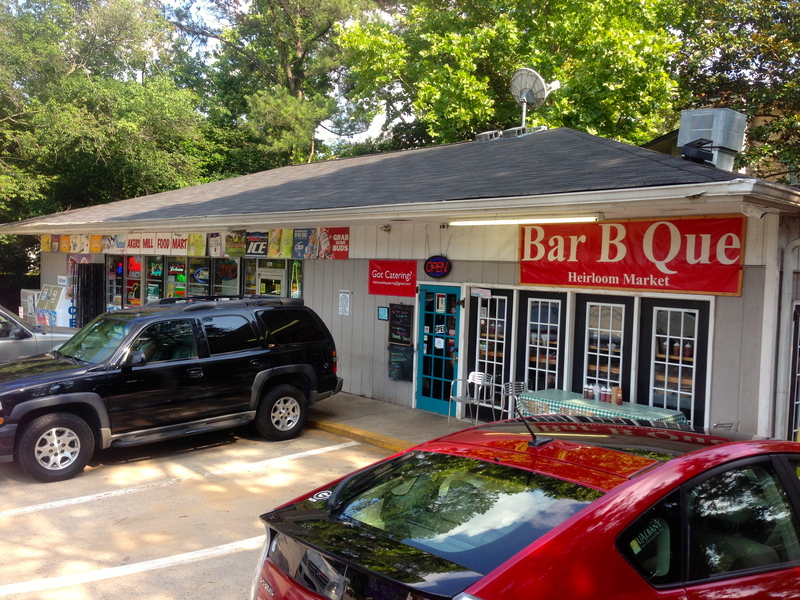 Don’t let the looks fool you, because inside is some of the best BBQ in Atlanta. The parking lot is hard to get in and out of and it’s hard to find a space. You wonder what they were thinking when they picked this spot and we figured that they would have moved by now. Instead, they built an out building in the back to house their BBQ cookers. Looks like they are going to be here for awhile. The new building doesn’t give them any more room in the dining room, though. There’s room for about 12 people to eat in here. 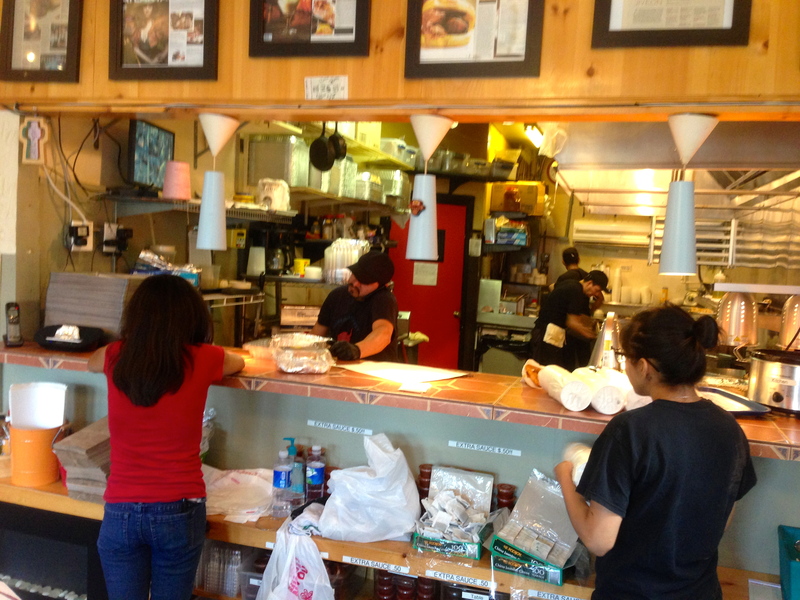 The kitchen is almost part of the dining room and the order fillers dart about the small space while they assemble your food. You wonder why anyone comes in here since it’s such a pain to get in and out of there. 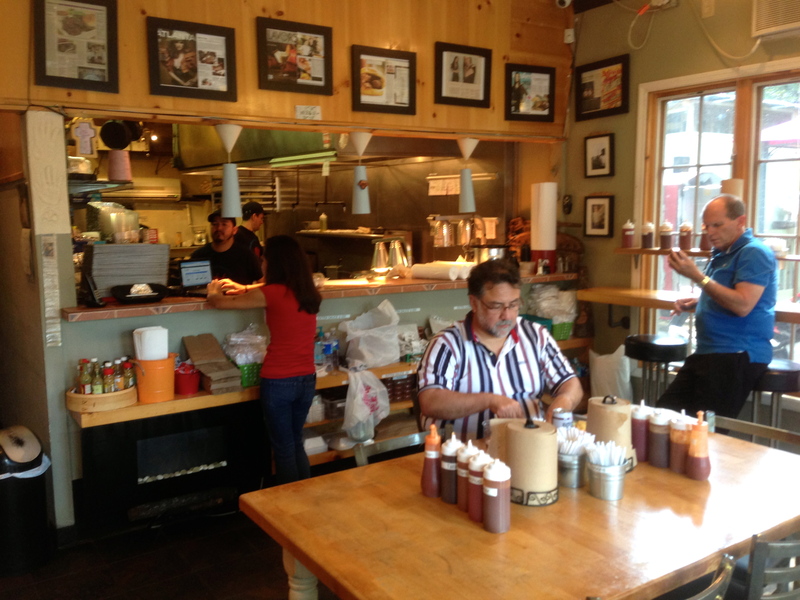 This place cries out, “don’t eat it here, get it to go!”, and we do exactly that. It’s Date Night and we aren’t going to take the food home. 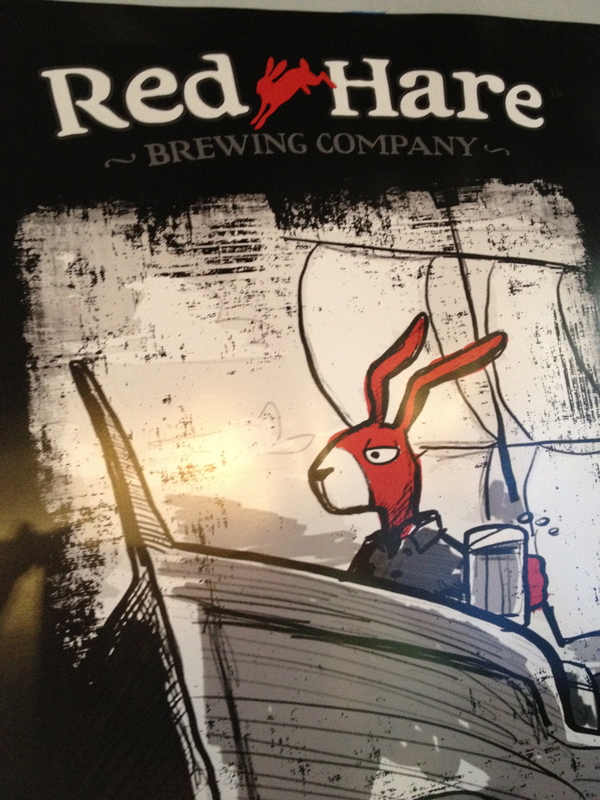 We are taking it to the Red Hare brewery in Marietta, where you will find some of the best beer in the ATL. Red Hare is celebrating the longest day of the year with a special edition of their Long Day Lager. 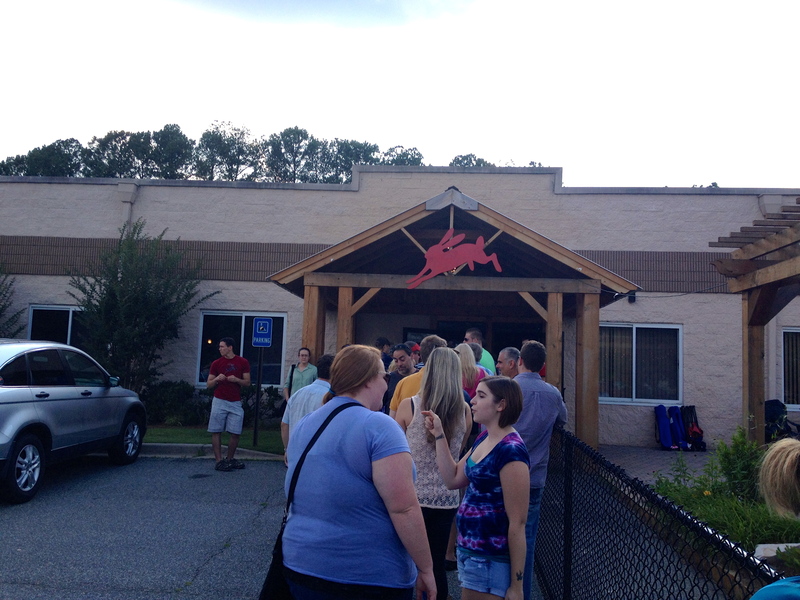 We arrive a few minutes before they open and there is already a line. We like a beer before we eat, and tonight we get beer before, during and after dinner. 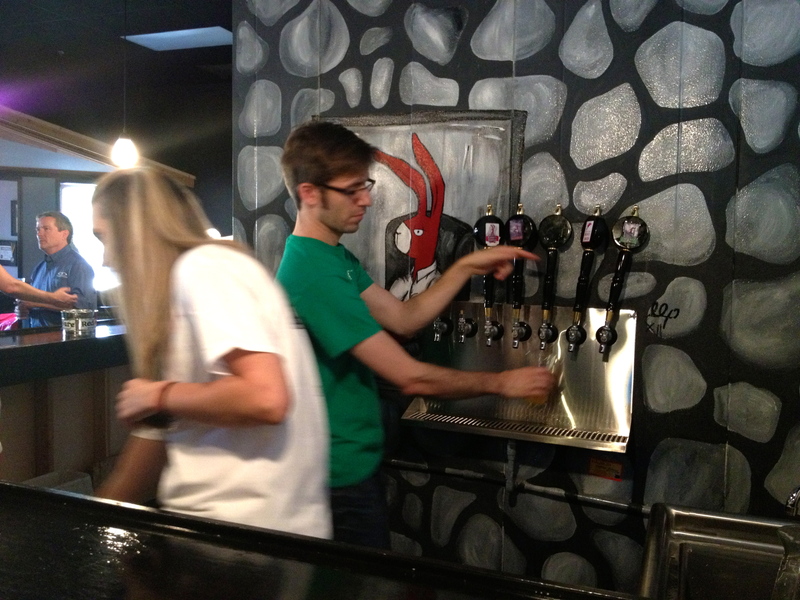 For $10 you get a Red Hare glass and 6 8-ounce “tastes” of their beer, poured by friendly people. I want this job! Our dear friends and Date Night regulars Claudia and Randy are meeting us tonight, and we have picked up food at Heirloom for them as well. A sample of the sampler. We both get the Georgia Sampler, which is BBQ pork, chicken, ribs and brisket. 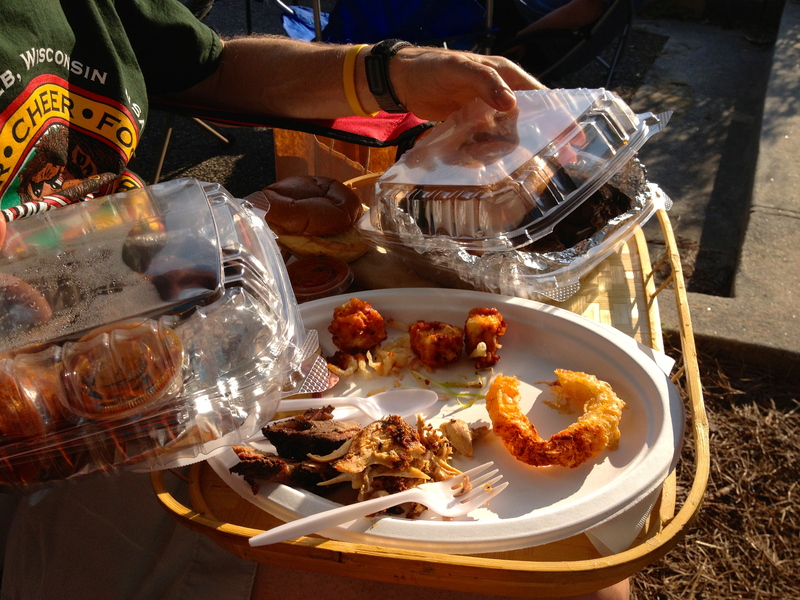 It comes with three sides as well, which makes this enough food for at least six people, not four. We would have saved you a bite, but there are no leftovers. 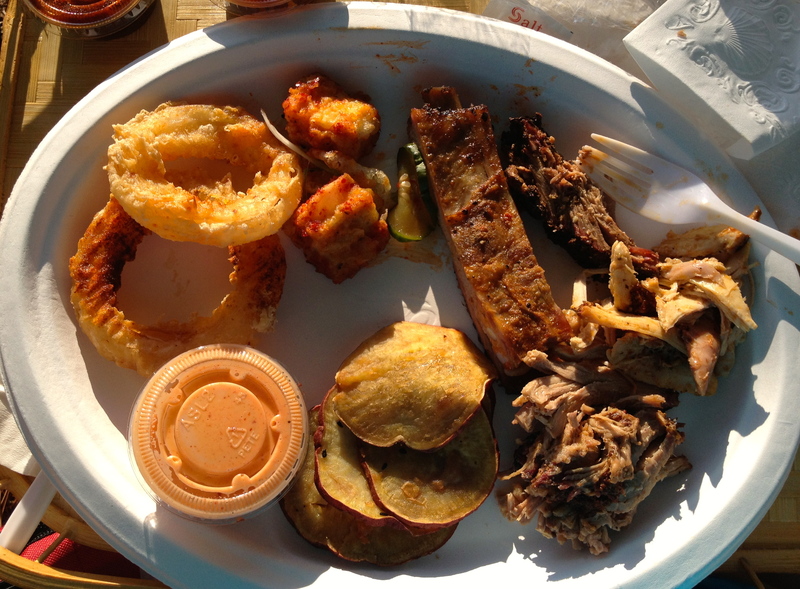 Check out the good stuff on this plate! 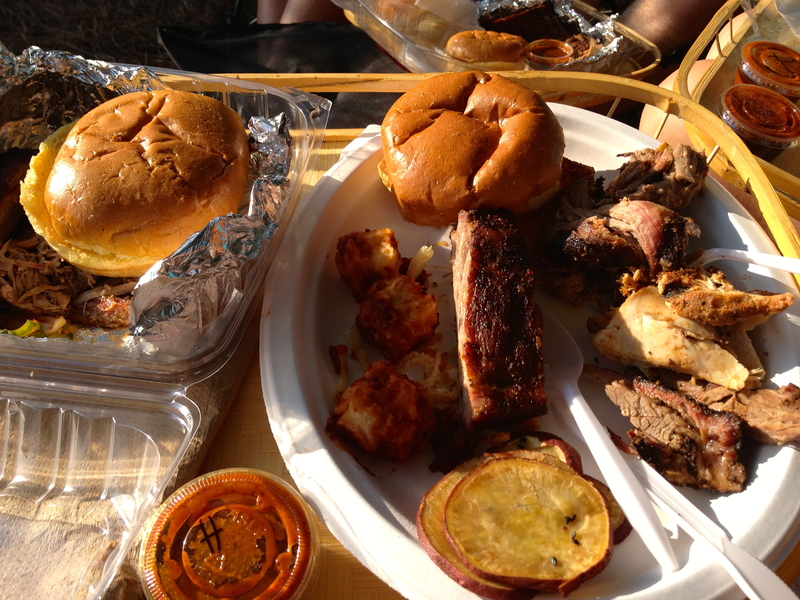 We get onion rings, bbq sweet potatoes and spicy tofu as our sides. Tofu? Heirloom has a Korean influence in their side dishes as one of the owners is Korean. C and R have different sides, going more traditional with the brunswick stew, cole slaw and baked beans. We vote on our favorite dish and it’s the ribs. The perfectly-cooked meat falls off the bone as we eat it. Another food shot, because you know you want it. Ian Campbell and the Recruits are playing classic rock at the brewery tonight, so now we have beer, BBQ and music. You may have noticed that we didn’t take any pictures of our beer, a “clerical error” on our part. We are having such a good time that we forget to chronicle the brew, but we tasted everything that was available. The Longest Day Lager is supposed to have blueberry and blackberry jam in it, but I don’t taste much of it. The regular Long Day Lager is a lighter beer that you would want to drink every day during the summer. The Gangway IPA is hoppy, but not bitter. The Watership Brown is one of our favorite brown beers. 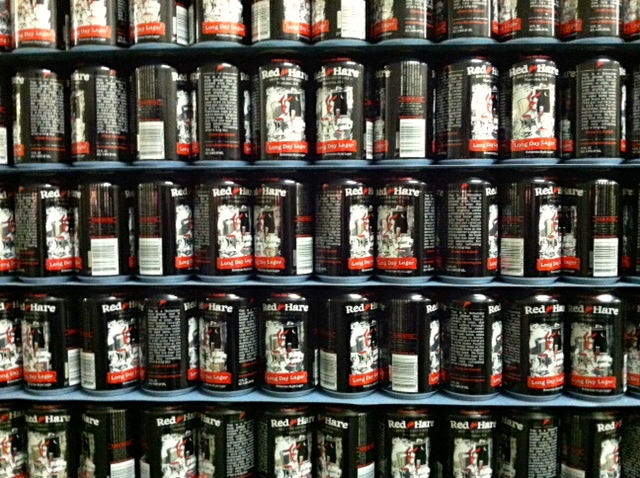 You can get it in cans if you haven’t tried it yet. And for dessert, we had the chocolate porter, which has chocolate and maybe some coffee in it. It’s like the Watership Brown on steroids. Date Night ends shortly after the sun sets on the longest day of the year. Good friends, good beer, good food and good music–it’s been quite the day. That’s an ingenious idea to pick up the bbq and take it to a brewery. I am not sure I would have thought of that. You like this place better than Fox Brothers and Fatt Matts? Thanks, Aaron. It’s hard to believe, but we have not done Fatt Matt’s or Fox Brothers yet on Date Night. So many places, so little time. But we would put Heirloom up against another of our favorites, Bone Lick. It’s all about the ribs, and these ribs are amazing.